They all knew about MJ’s true physical conditions at “This Is It” rehearsals….and they all LIED ! #MJFam The executor of Michael Jackson Estate, Branca, Randy Phillips, Frank DiLeo lying on CNN, mentioning Ortega…. Randy Philips slapped and screamed at Michael Jackson, pushing MJ in a corner and having a doctor performing malpractice on MJ. They all knew about MJ’s true physical conditions at This Is It rehearsals…. Email on June 14, 2009 from Ortega to Gongaware: Paul, MJ did not have a good Friday and he didn’t show on Saturday. MJ did not have a good Friday and he didn't show on Saturday. Email ends: We want to remind him that it is AEG, not MJ who is paying his salary. We want him to understand what is expected of him. Panish: Would it be fair to say as of June 14, 2009, you thought the show was in jeopardy? Panish: You saw, at least 4 times, MJ come to rehearsal in a condition you'd describe as under the influence? Ortega said Karen Faye, Travis Payne, Alif Sankey, assistants Stacy Walker and James Faris raised concerns about MJ’s physical condition. Ortega said Karen Faye, Travis Payne, Alif Sankey, assistants Stacy Walker and James Faris raised concerns about MJ's physical condition. Email On June 16 from Bearden to Ortega: Hey guys! on MJ’s lead vocal re-sings. I’m not sure if we’re going to get what we need in time. Hey guys! on MJ's lead vocal re-sings. I'm not sure if we're going to get what we need in time. Email cont’d: and take out ad libs and such to try to make it feel new. Email cont'd: and take out ad libs and such to try to make it feel new. Ortega said MJ arrived at night to rehearse on June 19, probably in the evening around 9 o’clock. Ortega said MJ arrived at night to rehearse on June 19, probably in the evening around 9 o'clock. “I saw a Michael that frightened me, a Michael that was shivering and cold,” Ortega said. "I saw a Michael that frightened me, a Michael that was shivering and cold," Ortega said. Ortega: He, I thought there was something emotionally going, on, deeply emotional, thought something physical going on. He was cold. Panish: Troubling? Ortega: Very troubling As to his physical condition, Ortega said MJ was shivering, just seemed fragile. As to his physical condition, Ortega said MJ was shivering, just seemed fragile. Panish: Did it appear he had lost weight? "I observed Michael like I had never seen him before," Ortega said. It troubled me deeply, he appeared lost, cold, afraid." Ortega said MJ was coherent. "I think when he first came in he didn't seem coherent, but when I started talking to him he became better." Ortega: He seemed to warm up and feel a little better, but he wasn’t well. Ortega: He seemed to warm up and feel a little better, but he wasn't well. Panish: Did you feel something was wrong? Panish showed picture of MJ’s fitting on June 19th and asked if that’s how he always looked. Panish showed picture of MJ's fitting on June 19th and asked if that's how he always looked. Panish: Is that how he always looked? Panish: Did you ever seen his like that before? "I remember asking for food, I asked if MJ had eaten" Ortega recalled. "I remember calling the doctor, I was very upset and I was concerned"
Panish: Do you remember crying? Panish: Were you crying because you were concerned with Michael? P: Being a drama queen? Panish: Did you try to tell AEG there was a problem? Panish showed email chain “Trouble At The Front”. Ortega said he sent emails to AEG only when he thought it was absolutely necessary. Panish showed email chain "Trouble At The Front". Ortega said he sent emails to AEG only when he thought it was absolutely necessary. Email cont’d: and Kenny was concerned he would embarrass himself on stage, or worse yet – get hurt. Email cont'd: and Kenny was concerned he would embarrass himself on stage, or worse yet – get hurt. Email ends: The company is rehearsing right now, but the DOUBT is pervasive. Time to circle the wagons. "We have a huge problem here." Email cont'd: I have watched him deteriorated in front of my eyes over the last 8 weeks. Email from John Branca to Phillips, Gongaware, Joel Katz, Frank DiLeo, Michael Kane on 6/20/09 : “I have the right therapist/spiritual advisor/substance abuse counselor who could help (recently helped Mike Tyson get sober and paroled) Do we know whether there is a substance issue involved (perhaps better discussed on the phone). Email cont'd: Do we know whether there is a substance issue involved (perhaps better discusses on the phone). Phillips replied: Tim and I are going to see him tomorrow, however, I am not sure what the problem is. Chemical or physiological? Tim and I are going to see him tomorrow, however, I am not sure what the problem is. Chemical or physiological? Take the doctor with you. Why wasn't he there last night? Panish: And you had a real concern with Dr. Murray? Panish asked if Ortega thought MJ was not being cared for. “Not at the level I’d expected Michael deserved,” he answered. Panish asked if Ortega thought MJ was not being cared for. "Not at the level I'd expected Michael deserved," he answered. "He seems lost, not like the Michael I'd seen," Ortega said. "I couldn't see his body but his physical presence wasn't what I had seen last"
Ortega said he believes his email was a strong suggestion that MJ needed to be seen by a doctor for his psychological condition. Randy Phillips to Ortega: ‘There’s nothing to be afraid of, we are going to do this, This Is It.’ That’s the Michael I had allegiance to. Ortega: 'There's nothing to be afraid of, we are going to do this, This Is It.' That's the Michael I had allegiance to. Phillips responded to Ortega that he not be an amateur psychiatrist. Ortega said that was not his intention. Ortega didn’t think Dr. Murray was giving good care to MJ. Ortega didn't think Dr. Murray was giving good care to MJ. Panish: Do you think you were trying to sound an alarm? P: Raise a red flag? Panish: Were you trying to concern Mr. Phillips about this situation? “I felt Michael was in trouble and needed help,” Ortega said. "I felt Michael was in trouble and needed help," Ortega said. Panish: If Phillips were more concerned about getting the show on the road rather than MJ, would that worry you? Ortega: Yes, because they were talking about a person’s health, I was more concerned about Michael’s health than anything else at that time. Ortega: Yes, because they were talking about a person's health, I was more concerned about Michael's health than anything else at that time. Phillips testified he thought Ortega was entrenched in the situation and not being open minded. Ortega disagreed with Phillips’ perception. Phillips testified he thought Ortega was entrenched in the situation and not being open minded. Ortega disagreed with Phillips' perception. Ortega: I wanted it to be taken care of, whatever it was, I wanted it looked into and taken care of. 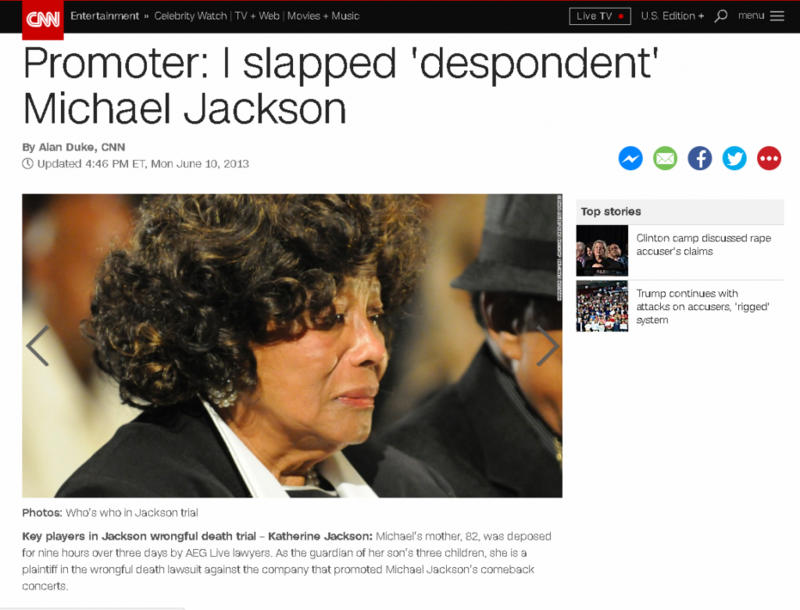 Panish: In all the time you knew MJ, did you ever see him in the condition he was on June 19th? “I just wanted Michael to be ok,” Phillips said. He trusted both Phillips and Gongaware. "I just wanted Michael to be ok," Phillips said. He trusted both Phillips and Gongaware. Panish: Do you know how you felt? Gongaware told Ortega about the meeting on the 20th. Neither Phillips nor Dr. Murray ever told Ortega they spoke on the phone for 20 mins. Meeting on the 20th was between Michael, Dr. Murray, Randy Phillips and myself. It happened at the parlor in the house. Ortega said when he realized the meeting was about him, he stood up to express his feelings. Ortega did not stay very long at that meeting. He estimates 10-15 minutes, definitely under a half an hour. Ortega left by himself. The others stayed: Jackson, Dr. Murray and Phillips. Ortega described the meeting as "accusatory." Panish: Who was the one being accused? P: Who was accusing you? Dr. Murray was upset with Ortega, the director said. Panish: Did Phillips ever tell you that he had a phone conversation, for 20 minutes, on June 20th with Dr Murray? Ortega said all he’s familiar with is that Phillips had a lengthy conversation with Dr. Murray at some point. Ortega said all he's familiar with is that Phillips had a lengthy conversation with Dr. Murray at some point. Ortega said Dr. Murray was angry at him at the meeting, “I was shocked,” Ortega explained. Ortega said Dr. Murray was angry at him at the meeting, "I was shocked," Ortega explained. Ortega: I was shocked because what he was saying it wasn’t at all reflecting of what happened. Ortega: I was shocked because what he was saying it wasn't at all reflecting of what happened. Ortega said he excused himself. Dr. Murray said MJ was fine and could handle all responsibilities for the show. “I was flabbergasted! Because I didn’t believe that was possible,” Ortega testified, saying he felt hurt, insulted. "I was flabbergasted! Because I didn't believe that was possible," Ortega testified, saying he felt hurt, insulted. Panish: Did Michael stick up for you? Ortega: He (Dr. Murray) was upset with me, and he said I had no right to not let MJ rehearse. Ortega: Dr. Murray said MJ was physically and emotionally capable to handle all the responsibilities of the performance. Ortega said Dr. Murray told him to stick with his job and to leave the doctor job to him. Email from Gongaware: "We want to remind him that it's AEG, not MJ, who is paying his salary." Phillips said "We want to remind Dr Murray that it's AEG, not MJ, who is paying his salary. We want him 2 understand what's expected of him"
Gongaware called Ortega from the hospital. “Our boy is gone,” Ortega said Gongaware told him. Gongaware called Ortega from the hospital. "Our boy is gone," Ortega said Gongaware told him.